West Windsor, N.J. - Buckle your seat belts for a ride back to 1960s Baltimore when hairdos were high and the music was boppin'. Join Mercer County Community College Theatre students, community actors from the James Tolin Memorial Fund (JTMF), and several other community actors for the unforgettable musical "Hairspray" at MCCC's Kelsey Theatre. Dates and times for this colorful comedy are Friday, April 13 at 8 p.m.; Saturdays, April 14 and 21 at 8 p.m.; and Sundays, April 15 and 22 at 2 p.m. Kelsey Theatre is located on Mercer's West Windsor campus, 1200 Old Trenton Road. A reception with the cast and crew follows the opening night performance on April 13. Tracy Turnblad is the lovable, plus-size heroine with a passion for dancing. When she gets the chance to audition for a spot on a local TV dance program with teenage heart throb Link Larkin, she thinks her dream has come true. But Amber Von Tussle, the program's reigning princess, has other plans. Can the endearing, good-natured Tracy win a spot on the show and the heart of her crush, while also breaking down the barriers between the races? Find out in this hair-raising performance filled with music and dance numbers the entire family can enjoy! According to MCCC Theatre/Dance Program Coordinator Jody Person, Theatre students will be working with JTMF for the first time. "It's a great experience for our students to work with experienced community actors." He adds that this is a large cast so there will be opportunities for many actors to show off their talents, and the cast, with its varying ages, will provide a better reflection of the real show, with adults playing the adult roles and students playing the roles of the young dance enthusiasts. JTMF was eager to collaborate with MCCC students on the project, Person said. "They are a small, but committed group that performs every year at Kelsey Theatre as a fundraiser in memory of MCCC alumnus James Tolin, who died of AIDS. The group awards two scholarships to MCCC Theatre students each year. Now they are taking that relationship further by working with our students. It's a big musical that reflects JTMF's mission of appreciating and respecting diversity." Dance on! Pictured, front row from left, are Kristen Kane as Tracy Turnblad and Tommy Thomas as Seaweed J. Stubbs. Back row from left are ensemble members Nilah Montgomery, Adiin Clemons, Domonique Jarrett and Maleek Colvin. 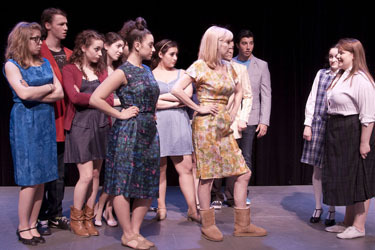 Pictured, from left, are: Sabella Lichtman, Dan Johnson, Julia Procaccino, Meredith Bleemer, Shannon Brueckner, Nicole Erkoboni, Vicky Wyman, Parker Harris (partial), Ben Menahem, Megan Sherow, and Kristen Kane starring as Tracy Turnblad. Featured cast members include: Kristan Kane of Plainsboro as Tracy Turnblad; Ethan Daniel Levy of Plainsboro as Corny Collins; Brian Bara of Levittown, Pa., as Edna; Megan Sherow of Millstone as Penny Pingleton; Vicky Wyman of Monroe Township as Velma Von Tussle; Shannon Brueckner of Jackson as Amber Von Tussle; Ben Menahem of Plainsboro as Link Larkin; and Tommy Thomas of Georgetown, England, as Seaweed Stubbs. Other cast members include: Domonique Jarrett of East Windsor as Little Inez; Taylor Pickett Stokes of Trenton as Motormouth Maybelle; Tom Orr of Ewing as Wilbur Turnblad; Melissa Kettner of Bordentown as Prudy Pingleton; Jon Cintron of Trenton as Harriman F. Spritzer; Adiin Clemons of Trenton as Stooie; Nilah Montgomery of Princeton as Cindy Watkins; Theodoria Rovira of Hamilton as Lorraine; and Maleek Colvin of Trenton as Duane. Ensemble cast members are: Kim Guillaume of Hamilton, Nicole Erkoboni of Lawrenceville, Chris DiTullio of Lawrenceville, Alexandra Baldwin of Lawrenceville, Parker Harris of Lawrenceville, Dan Johnson of Ewing, Sabella Lichtman of Monroe Township, Julia Procaccino of Yardley, Pa., Meredith Bleemer of Oreland, Pa., Amariss White of Trenton, Rachel Garretson of Cranbury, Jeni Starinksy of East Brunswick, and Stephanie Ortiz of Lawrenceville. The show is directed by Jeremy Robinson, an MCCC adjunct professor who teaches musical theatre, with choreography by Person and stage management by Kelsey's own Tracy Antozzeski. Mercer's Entertainment Technology students will provide lighting and sound under the direction of Program Coordinator Robert Terrano. For the first time, these students will do video projection work to set the scene of historic Baltimore. Tickets are $18 for adults, $16 for seniors, and $14 for students and children. Tickets may be purchased by calling the Kelsey Theatre box office at 609-570-3333, or online. Kelsey Theatre is wheelchair accessible, with free parking next to the theater. For a complete listing of adult and children's events for the remainder of the 2011-12 season, visit the Kelsey website or call the box office for a brochure.